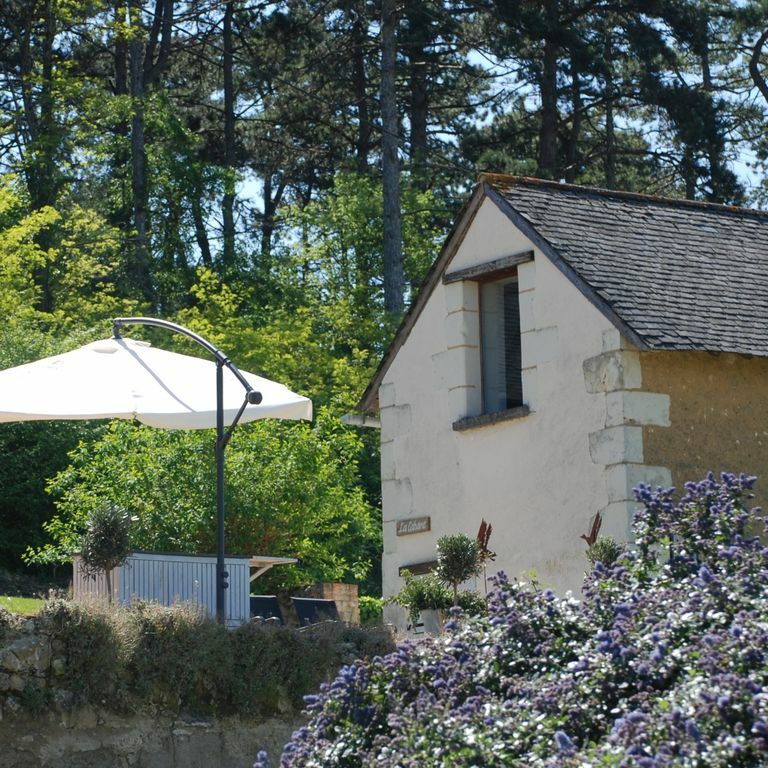 La Cabane was completely renovated and fitted with every convenience. You enter into the completely fitted kitchen with dishwasher, fridge freezer combo, oven, ceramic plates with extractor hood, microwave, electric kettle, coffee machine and obviously enough pots, pans, kitchen gear, tableware, glassware and cutlery. The living quarters offer a snug dining and sitting area with TV and DVD player. From the living room you have access to the bedroom with in it a comfortable 160 x 200 cm bed. Next to it you will find the bathroom with a washbasin and cabinet, a comfortable rain shower and a toilet. A comfortable garden set with sunshade and barbecue. A fully made bed and bath and kitchen linen. A stock of basics: oil, vinegar, herbs, coffee (filter bags), tea, sugar, washing-up liquid and toilet paper. Electric heater which makes La Cabane a good place to stay in every season. Free wireless internet in the gite. Lavau’s roots go back to the Netherlands. Next to our farm was an old cowshed which we converted into a holiday cottage. We received our first guests there in 2005, who were followed by many other nice and enthousiastic people from all over Europe and even far beyond. This “tasted” of more and gradually through the years our wish grew to continue this on a larger scale in France. After a thorough orientation and search throughout France we found “our spot” in the Loire area In October 2010 we settled here permanently. Rural and quietly located, but nevertheless very central. It is precisely this location that makes Lavau to the perfect start of a holiday with unequalled opportunities. Go visit the charming little towns in the surroundings and visit the stately castles with their colourful gardens. Explore the extensive caves – and do not forget to taste the delicious wines and local dishes of the Anjou! Rather a more active type ? Then you can go for a walk or go cycling, canoeing, swimming or play a round of golf in the vicinity…. At the end of the day the luxury of silence, the splendid view and often overwhelming sunset are waiting for you in Lavau. Table d'hôtes Whether you have been out and about all day or enjoyed the peace and quiet of Laveau, the finishing touch will be the three course dinner we serve several times a week. We use mainly local and seasonal produce with a preference for organic ingredients. Naturally the meal will be accompanied by a glass of fine wine. Convenience meal On the days we do not serve a 3-course meal, we can still take care of you. So, if you do not feel like eating out or shopping and cooking you can still have a lovely meal by making use of our convenience meal. These are freshly made single dish meals accompanied by French bread and a fresh salad; tasty and conveniently served in the cottage! The Loire has been known as the garden of France for centuries, and the nobility liked to settle there. When you take a neighbourhood tour of Lavau, you see one château after the other appearing into view. A large number of castles have been opened to the public. But even more castles are still privately owned and lived in, such as the château situated right behind Lavau. You should visit one of the historic towns and cities in the vicinity, for instance sophisticated Anger, the capital of Anjou, where you can do some great shopping. Or Saumur, with its many traditions, splendidly situated at the banks of the Loire …Every town and village in France, no matter how small, has its own church. There is something peculiar about a number of these churches, or rather about their spires. There are 32 crooked spires in the whole of France, 6 of which are near Lavau. The church in Fontaine-Guérin, for instance, has a spire with a twist to the left, whereas all the others have a twist to the right. The spire of Vieil Baugé is a real sight: it is not only crooked, but also leans over! Did the hand of the devil cause this, a kick of the Duke of Clarence’s donkey or workmen who drank too much wine when building the church, as local legends tell? You should judge for yourself. You should also visit one of the many gardens you can find in this area: gardens with straight geometric design, flower gardens, kitchen gardens, herb gardens … Enough variety to inspire you to take up gardening in your own garden again after the holidays. Besides gardens with plants, you will also find a very special garden with animals: Le Bioparc Zoo de Doué-La-Fontaine. Here you will find an unusual collection of animals in a maze of caves with luxurious plants. This zoo is unique in Europe by its remarkable troglodyte landscape: ancient sandpits, limekilns, caves and cellars the size of cathedrals. Absolute highlights are the valley of the black rhinoceros which has been carved from the rocks over 2 hectares, the leopard canyon and the panoramic restaurant with a view of the vally of the giraffes. In this area, which is so rich in history, lots of authentic artefacts have been lovingly preserved and collected in museums. There is a huge choice, varying from old crafts to toadstools and from ancient tapestries to modern-day art: just think of it, and there is a museum. We would really like to recommend this, and definitely not just for a rainy day. Lavau is situated in the Parc naturel regional Loire-Anjou-Touraine, a large protected natural area where a lot of attention is given to landscape management. For example, you can ride part of the bike route La Loire à velo through the park. La Loire à velo is a household word in France, 600 kilometres of cycling through the most beautiful areas along the Loire. Part of this famous bike route runs through the alternating landscape of the Anjou. For hikers, too, this area offers an extensive network of short and long distance hiking trails. Have you been active on a hot day and looking for refreshment? This is easily found in the village. It has a lovely lake for swimming, where small children can paddle nicely. Something you really should do in addition to walking and cycling when you are on holiday in this area is wine tasting. The wine country between Angers and Saumur, with its 20,000 hectares and 30 Appelations d’Origine, is the third largest AOC area of France. On the south bank of the Loire in particular a large number of vineyards stretch out, where you can taste mostly excellent wines at the wine farmers’. The Cremant de Loire, a sparkling white wine and refreshing appetizer is certainly worth trying. Die Energiekosten betragen 0,20 € pro verbrauchter kWh.